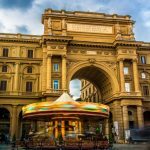 Piazza della Repubblica – Florence or Paris? 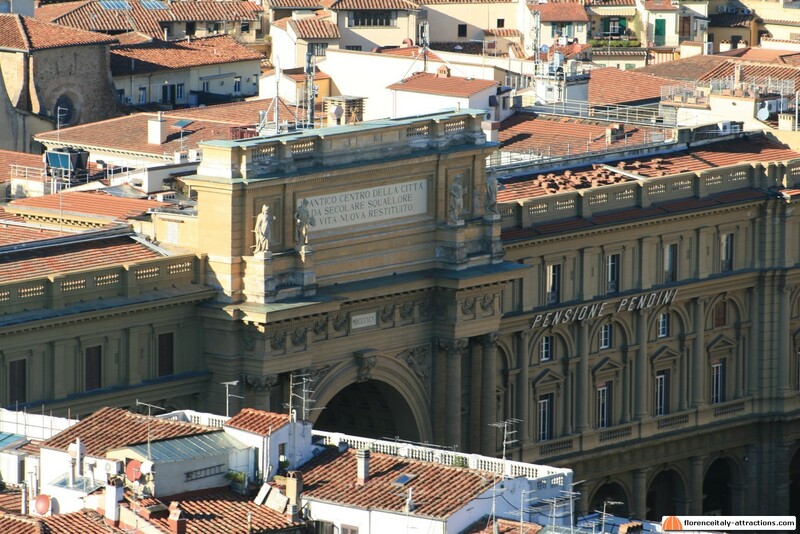 Each walking tour in Florence Italy makes a stop in Piazza Della Repubblica, which is considered a minor attraction. Apparently modern, with a sort of “Arc de Triomphe”, this square really doesn’t fit the medieval historical center of Florence Italy, but don’t get fooled: more than 2000 years of history lay in this place, the most ancient in Florence, because Piazza Della Repubblica was the exact center of the ancient Roman town. 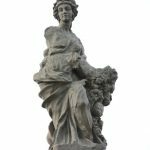 Once here were the main buildings that each Roman town had: the Forum, the Capitolium, the Temple, and in the exact center of the city, a pillar with a statue representing abundance (see picture). 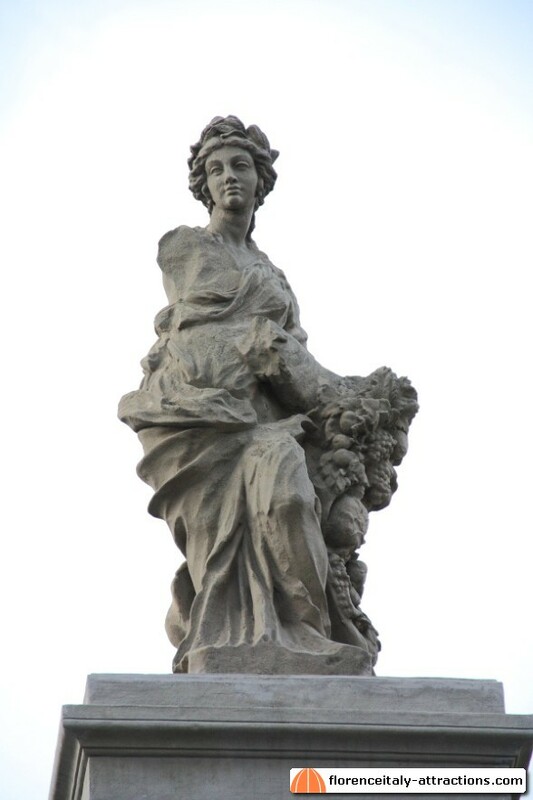 Although the statue nor the pillar are the original Roman ones, they’re there to remember the origins of Florence. 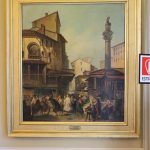 For all the Middle Ages and even later, this place has been the central market of Florence. Very different from now, the square didn’t exist and the small streets were really crowded of people buying groceries. 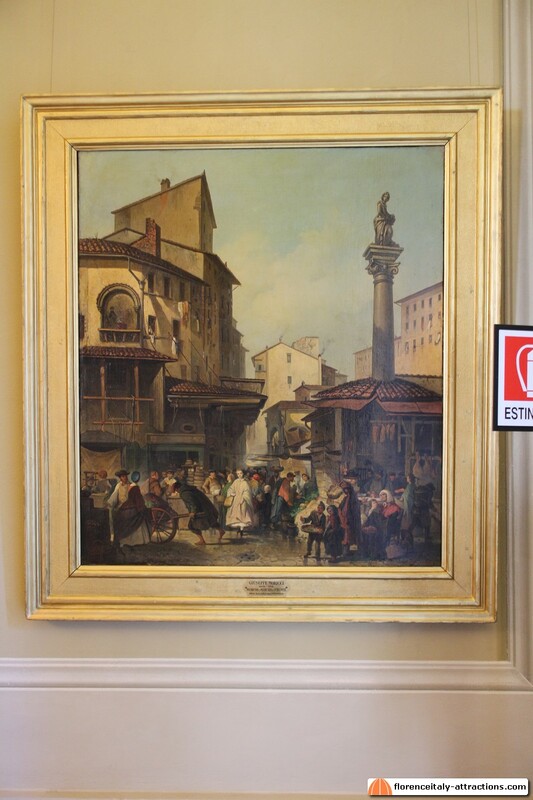 It’s hard to identify the place looking at the painting in the picture (Modern Art Gallery, Pitti Palace): only the pillar with the statue of abundance reveals where the painting was made. In the second half of the 16th century, the Jewish ghetto was built here. 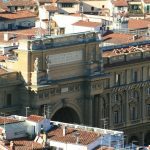 The ghetto was imposed by the Catholic church, but in a city of bankers like Florence Jewish people were respected; Florence was the last Italian city to build a ghetto. When the Kingdom of Italy was proclaimed in 1861, the capital city was Turin. 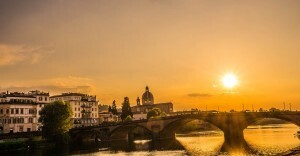 With Rome not available (still part of the properties of the Pope), and Turin too North in the new country, Florence was chosen as the new Capital City. In that age, Paris was the leading city in Europe: the example to follow. An entire Medieval district was destroyed, to make space for the offices of the Public Administration. Here comes the large square you can see today, initially named Piazza Vittorio Emanuele II, honoring the first King of Italy. The “Arc de Triomphe” shows an inscription which means: “the ancient city center after centuries of misery has been given new life”. 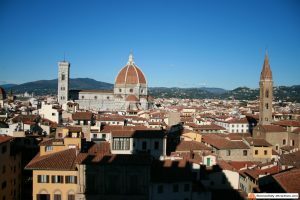 Actually, Florence lost one of the most typical districts, many Medieval towers and churches were torn down. Remains of the ancient city center and a map showing how it was before are visible in the San Marco Museum. With the conquer of Rome in 1870, Florence was not even the capital city anymore when work of restoration finished in 1890. The large buildings were never used for their original purpose. In 1946, just after World War II, Italians voted in a referendum choosing Republic over Monarchy. That’s when Piazza Vittorio Emanuele II became Piazza Della Repubblica. Today the square is famous for historical cafès. 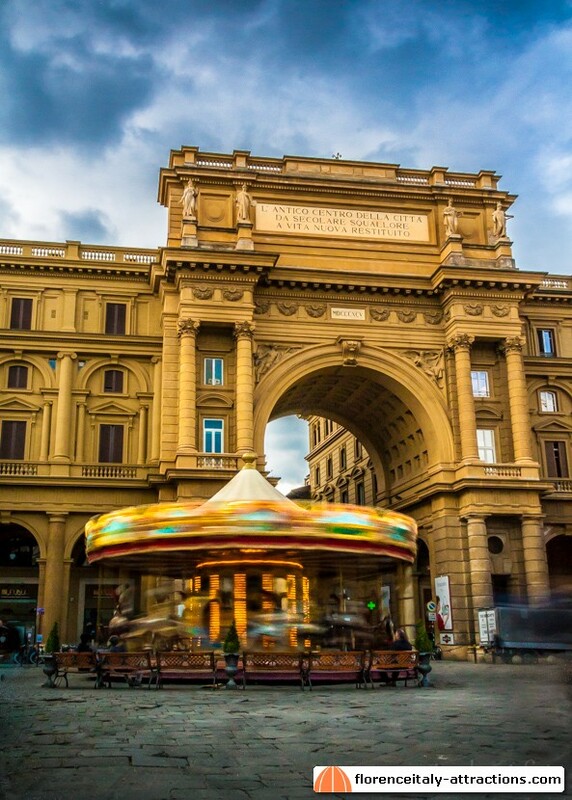 Some years ago Piazza Della Repubblica was closed to cars, a carousel for children was added and the place is much more enjoyable.